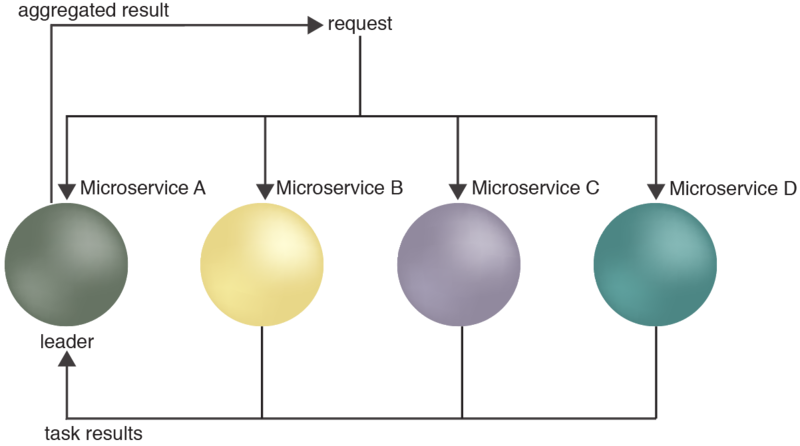 How can multiple instances of the same microservice be coordinated to complete a greater task? Sometimes the completion of a task requires the involvement of multiple instances of the same microservice. If the service consumer invoking the microservice instances does not have the necessary logic to coordinate them, runtime exceptions can occur leading to data corruption and failure to complete the task. One of the invoked microservice instances is designated as the leader node, responsible for aggregating the other microservice instances in a coordinated effort to complete the task. A reliable leader election mechanism is utilized, isolated from the microservice runtime to elect the leader node. The tasks and actions performed by a collection of collaborating instances in a distributed microservice architecture are coordinated by electing one instance as the leader to take responsibility for managing the others. This helps to ensure that tasks and operations are coordinated and that instances do not conflict with each other. The leader receives task results and aggregates. The complete pattern description explores application considerations and a scenario involving the leader election process.